It’s hard to get everyone in your photo to have great smiles and open eyes at the exact same instant. Luckily, now you have a new tool to at least fix the eye problem. 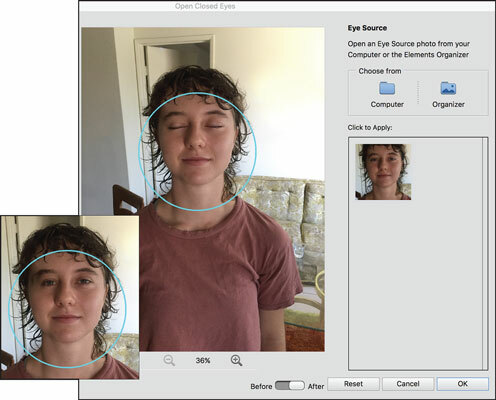 The new Open Closed Eyes feature in Photoshop Elements 2018 lets you use another photo of the same person(s) where their eyes were open and merges the two images into a nice hero shot. Choose Enhance → Open Closed Eyes or click the Eye tool in the Tools panel and then click the Open Close Eyes button in the tool options. The Open Closed Eyes dialog box appears, as shown. In the dialog box, a circle surrounds the area that will be affected by the adjustments. Choose a photo as your eye source image. You have the option of selecting from your Computer or from the Organizer. Click on the source image to apply it. Elements automatically applies the eyes from the source image and replaces the closed eyes. Fix images with the new Open Closed Eyes feature.